Walk, run, and have some fun at the Fairwood 50 5k Fun Run! Register here or be one of the first 100 people to arrive, and get a Fairwood 50 t-shirt! All proceeds go to support the Kentridge High School Cross Country Team. Registration opens at 8:00 am and the race starts at 9:00 am on August 27th, at Petrovitsky Park . 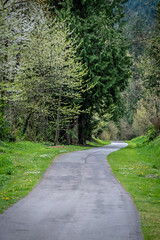 The course loops through residential streets, monitored for safety by the King County Sheriff’s Office, and includes an exciting portion of a King County forest trail. A great course for all ages and skill levels! Click to see the full course map. 1st place male and female finishers will receive a $100 gift certificate from the Fariwood Golf and Country Club for Proshop Merchandise. 2nd and 3rd place male and female finishers will receive $50 gift certificates from the Fairwood Golf and Country Club for lunch at the club. This Week Only (8/8/16): Register before Monday, August 15 at 8:00 am and be entered to win a free night in the King County Parks Camping Container! This week only: Register before Monday, August 22 at 8:00 am and be entered to win free tickets to the NEEDTOBREATHE Concert at Marymoor! Are race results posted somewhere? The winners were announced on site after the race, so no, results were not posted. Hope you enjoyed Fairwood50!